Don't forget we are always at the Raumati Social Club (Raumati South) on the last Thursday of every month. We had a great night last night with Paul Schreuder filling in for Andrew who has been off swanning around Australia and the Pacific playing with his trio on the cruise ships..... sooo tough!!!! No bovine rock there I bet. wWe also had Carylann Martin sing a few tunes with us which was fun, what a great voice she has. 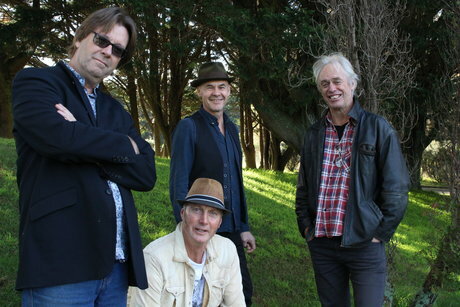 Looking at lining up a few gigs in Wellington and if you look at our gig page there is one due in New Plymouth ( a first time visit) and also Palmerston North in July. Rest assured we are constantly and vigilantly attempting to get over that ever present Cattlestop and bring our music to the rest of the country. Getting this herd together at the same time is a constant challenge but we are always in the MOOd for it. Unfortunately there was a mix up with our gig at Thunderbird on Nov 11th so will reschedule in 2017. Currently organising gigs for next year with a few trips away to Taranaki, Taupo etc. If you're in the Wanganui area we have a gig planned for the 16th of December so hope to see you there. We now have 3 written reviews and one radio recorded one for "Dance in the Rain", all up on our website (www.cattlestops.com), have a look and all comments are most welcome. Our regular Raumati Social Club gig on the last Thursday of every Month is going well so hope to see any of you in the Kapiti Region there to enjoy some great music and lovely food. A very relaxed evening. This band is made up of so many talented Musicians who are working in many different bands and line-ups so our lineup is often changing as well, this all provides great opportunities for variety and different sounds. The promotional Cds have nearly all gone out and it is now live for sales on this website and also digitally across the board. Who expects to get and money from recording these days anyway. So much fun playing with these guys we are looking forward to arranging gigs and seeing how many people we can play to over the next 12 months. any thoughts or questions please fire them back to me on james@cattlestops.com or info@cattlestops.com. 26th of August from 7-10 pm. If you can't make it and naturally you still want to purchase the Album!!!!!! you can do so on our website www.cattlestops.com or give me a call on 0278526226. Really looking forward to having the full band playing at the launch and catching up with as many of you as possible on the night. Hopefully gigs to follow but yet to organise. James Cameron & Andrew London are joined by Wayne Mason (Formula, The Waratahs, etc) on keys and Ross McDermott on lap steel, guitar, spoons and who knows what. for bigger gigs we are joined by Lance Philip on Drums and Nick Granville on electric guitar. 11 new songs have been recorded at Audio Suite in Paraparaumu and this new CD (Dance in the Rain) is due for release late August. As we get closer to the CD launch I will update this blog with more details. First off I'm trying to do some market research at the moment and would really appreciate some feedback to this question. When you listen to any of our songs what groups/bands/artists come to mind? It would be really appreciated and a lot of help if you could fire an email back to me at james@cattlestops.com or info@cattlestops.com. thanks in advance to any of you who can make the time to respond. We had a very nice review from Mike Alexander in the Sunday Star Times of our latest Album "Dance in the Rain". you can check that out on the website, www.cattlestops.com under reviews & interviews tab. More being planned and organised for 2017. Until then best wishes and Moo Moo to you all.